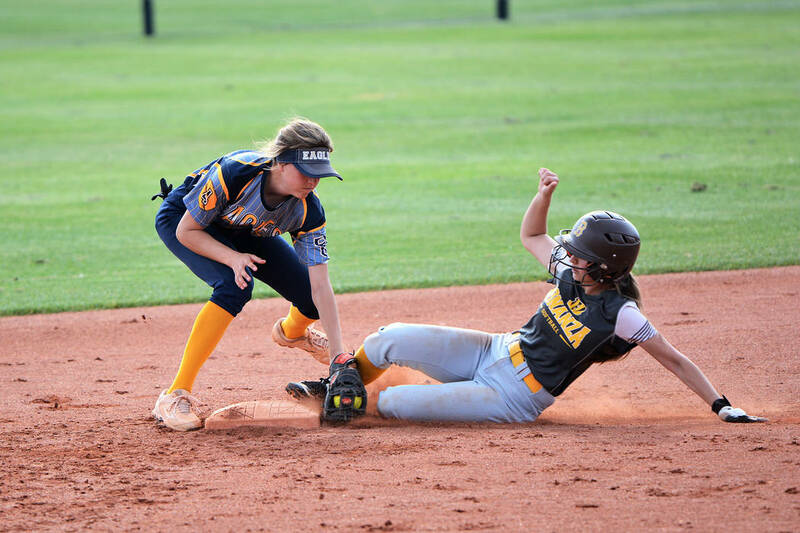 (Robert Vendettoli/Boulder City Review) Tagging the runner out at second base, Boulder City High School freshman infielder Paeton Carver ends the second inning against Bonanza on Monday, April 8, in the Lady Eagles' 9-6 defeat. In a heartbreaking league loss, Moapa Valley defeated the Lady Eagles 3-2 on April 4, while 4A Bonanza defeated Boulder City 9-6 on Monday, April 8. In an emotional rivalry game against the Pirates, senior Abby Giunta was charged the loss after allowing three runs off of five hits in three innings. Freshman Alyssa Bryant threw three scoreless innings of relief. The Lady Eagles were only able to muster up three hits collectively, one each from junior Ellie Ramsey, sophomore Rachel Krumm and freshman Paeton Carver. Against the Bengals, Giunta allowed six runs over three innings, while Bryant allowed three over four innings. Knocking in a run each for the Lady Eagles were seniors Ryann Reese (3 for 4) and Marleena Mills (2 for 4), sophomore Brooke Baker (1 for 3) and Carver (1 for 3). Off this week to recoup, the Lady Eagles will resume play April 24 against Chaparral. Results from Wednesday’s rivalry matchup against Virgin Valley will appear in next week’s issue. Sophomore Blake Schaper has the best outing of his career Monday, April 8, for Boulder City High School’s boys golf teaming, helping the Eagles defeat rival Pahrump Valley 311-363 at Boulder Creek. Shooting eight under the par 72, Schaper led all scorers with a final of 64. Shooting a season-low team score, the home course certainly benefited the defending state champion Eagles, which remain undefeated against 3A competition this season. Sophomore Kyle Carducci and senior Kevin Phelps scored 82, while sophomore Jace Waldron shot a 83. The Eagles will host a match at Boulder Creek today. Avenging last week’s first loss of the season, both Boulder City High School swim programs routed rival Virgin Valley at Henderson Multigenerational Pool on Saturday, April 6. Cruising to a 167-82 victory, senior Chandler Larson placed first in the 50-yard freestyle, 100-yard breaststroke and 500-yard freestyle. Freshman Martin Thompson placed first in the 100-yard backstroke and 100-yard freestyle. Sophomores Ethan Porter placed first in the 200-yard freestyle and Joe Purdue placed first in the 100-yard butterfly. For the Lady Eagles, senior Aimee Garcia placed first in the 100-yard freestyle and 200-yard individual medley in the team’s 208-71 rout of the Bulldogs. Sophomore Isabella Fecteau placed first 100-yard butterfly and 100-yard breaststroke. Senior Rose Pouch placed first in the 200-yard freestyle and freshman Rayna Freiburger placed first in the 500-yard freestyle. Off for the week, the Eagles will resume league play against Mojave on April 27 at Heritage Park. Results from the Eagles’ Tuesday, April 9, swim meet against Shadow Ridge will appear in next week’s issue. Hosting a weekday event April 4, both Boulder City High School track programs placed second, falling to rival Pahrump Valley, in the four-team event. Helping the girls score 82 points, behind Pahrump Valley’s 117.5, senior Alyssa Williams placed first in the 100-meter and 300-meter hurdles. Finishing first in their respective events were senior Erin Cowley in the discus, junior Keely Alexander in the 400-meter dash and sophomore Chloe Payne in the triple jump. Alexander placed second in the long jump and Payne placed second in the 100-meter and 300-meter hurdles. In distance running, sophomore Sophie Dickerman placed second in the 1600-meter run and freshman Mary Henderson placed second in the 3200-meter run. Finishing with a team score of 70, behind the Trojans’ 101, sophomore Sonny Peck placed first in the triple jump and 110-meter hurdles. Placing first for the boys were senior Justice Tilman in the 300-meter hurdles and senior Tre Hershey in the long jump, along with sophomore Rafe Echeverria in the shot put. Echeverria placed second in the discus and Sean White placed second in the 3200-meter run. Results from the Eagles’ weekday race at Valley on Wednesday, April 10, will appear in next week’s issue.